This research anthology explores the concept of food production and supply, from farm gate to plate, bringing together contemporary thinking and research on local, national, and global issues from a stakeholder perspective. 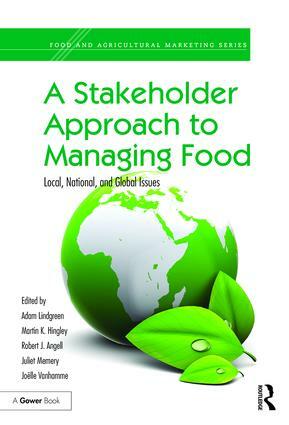 A Stakeholder Approach to Managing Food includes a number of sections to represent these challenges, opportunities, conflicts, and cohesions affecting relevant stakeholder groups within food production and supply and their reaction to, engagement with, and co-creation of the food environment. For some, local, national, and global interests may seem at odds. We are in an era of growing and pervasive multi-national corporations, and these corporations have significant influence at all levels. Rapidly growing economies such as China are a focus for the global brand, but is this a scenario of adaptation or homogenization of food? Alongside this trend toward national and global development in food, this volume presents the counter-reaction that is taking place (especially in developed countries) toward local speciality and culturally bound foods, with emphasis on the importance of the inter-connection of local communities and agri-food culture and economy. With an in-depth analysis of agricultural businesses, this book shows that the entrepreneurial spirit is alive and well in rural communities with often renewed and engaged connection with consumers and imaginative use of new media. This book will be of interest to students, researchers and policy-makers concerned with agriculture, food production and economics, cultural studies. Dr Adam Lindgreen is Professor of Marketing at Copenhagen Business School, Denmark. Dr Martin K. Hingley is Professor of Strategic Marketing at Lincoln Business School, UK. Dr Robert J. Angell is a lecturer at Cardiff Business School, UK. Dr Juliet Memery is Professor of Marketing at Bournemouth University, UK. Dr Joëlle Vanhamme is Professor of Marketing at Edhec Business School, France.